The Polka Dot Plant, or Hypoestes phyllostachya, is not only super cute, but also an easy to care for house plant. They’re known for being “dramatic” – wilting completely when they want water and perking back up quickly after they get it. This gives you a visual clue to what they need. 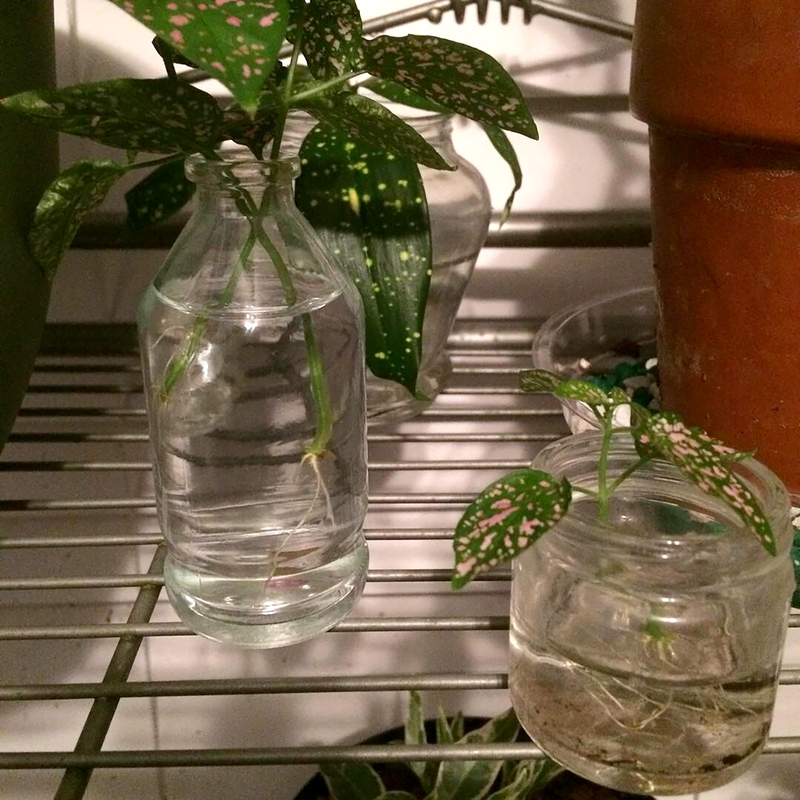 Polka Dot Plants also grow quickly, and they’re super easy to propagate in water! Also known as the Freckle Plant or Freckle Face, this plant comes in two varieties – “Splash” and “Confetti”. Splash varieties showcase lots of the pink, white, or red coloring, while the spots on Confetti varieties are more sporadic. This is a tropical plant that’s native to Madagascar, making it either a house plant or annual in most of the United States. If you live in a climate that’s warm year round, Polka Dot Plants can be grown outdoors as perennials that reach up to 3 feet tall! While this plant can tolerate lower light situations, it will likely revert back to all or mostly green leaves so that it can properly photosynthesize. If you want to get the most color out of your plant, bright indirect light is ideal. Polka Dot Plants can also become “leggy”, or develop long stems with fewer leaves, when they’re too far from a light source. If this happens, don’t worry. You can easily create a bushier and fuller plant by trimming off leaves regularly. For each leaf removed, two will grow in its place! Just make sure the plant has enough leaves left after a trimming to stay healthy. As mentioned earlier, Polka Dot Plants can be dramatic when it comes to water. You can certainly let the soil dry out between waterings, but the whole plant will wilt as if it’s dying. This can be alarming if you haven’t experienced it before, but a thorough watering will perk it back up in no time. This is helpful if you’re prone to over or under watering, but otherwise Polka Dot Plants like a moderate amount of water. Ideally, you should let the top 25% of the soil dry out between each watering. Be sure not to over water though, as this can lead to root rot. Since they are tropical plants, they appreciate a higher level of humidity. However they are relatively hardy plants and should do fine with regular watering in a normal humidity home. If you notice the edges of leaves browning, you might want to increase the humidity. This can be done with a humidifier, misting the leaves with a spray bottle, or placing a tray with pebbles and water underneath or near the plant. Polka Dot Plants are super easy to propagate. All you need is water, a small container, and scissors. 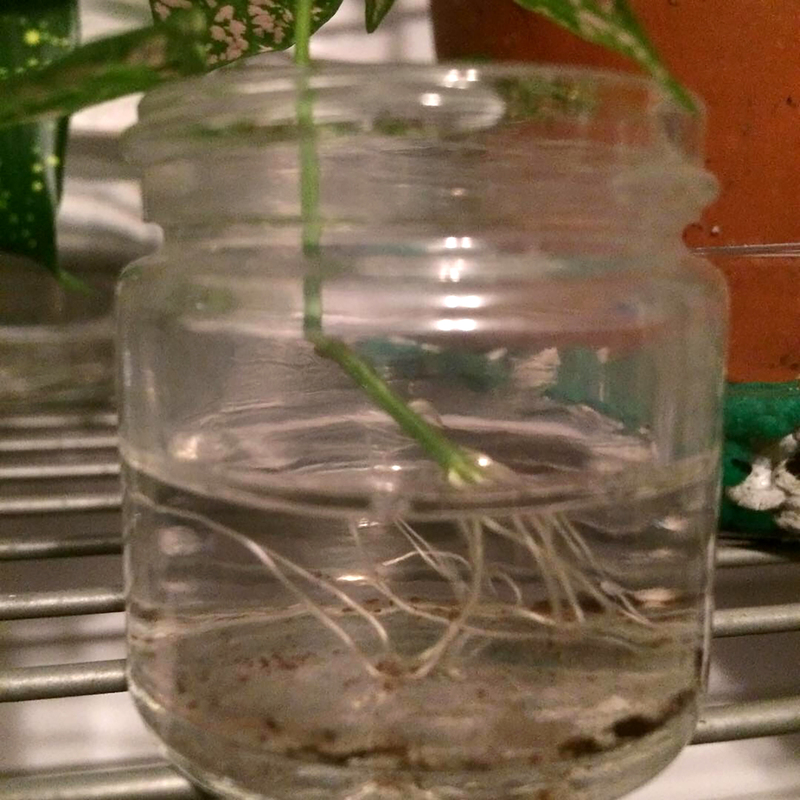 While many plants take weeks or even months to grow roots from cuttings in water, the Polka Dot Plant begins rooting in days. To propagate your plant, start by taking a cutting below at least two sets of leaves. The area where leaves grow is called a “node” and that’s where your roots will start. 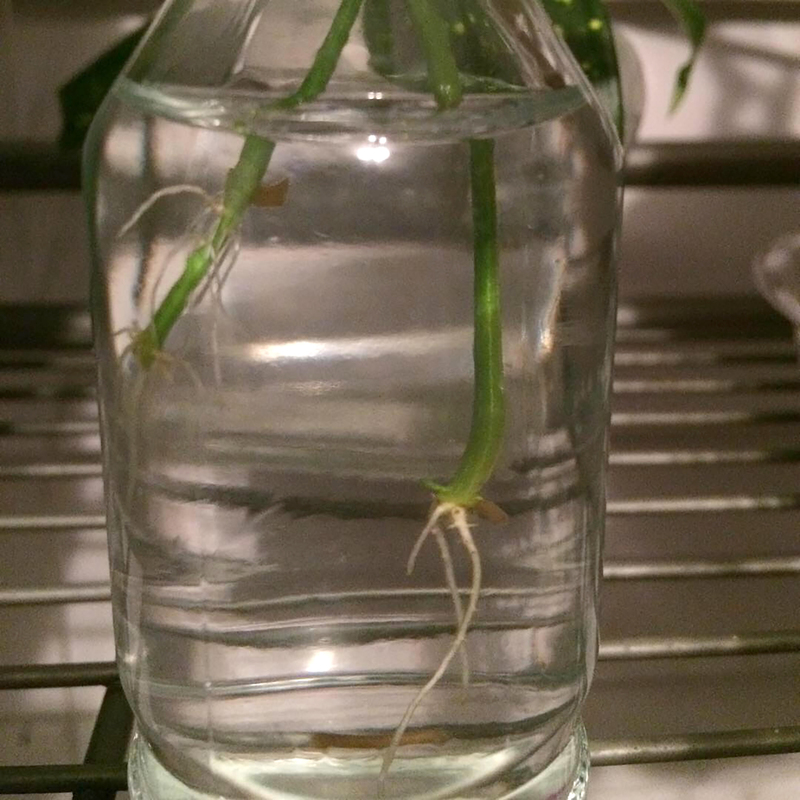 Cut off the bottom leaves and submerge the stem in water, leaving the top leaves above water. Place the container in a windowsill or somewhere it can receive light, and soon you’ll have a new plant! Be sure to replace the water every few days to keep the plant healthy. Once the roots are long and full enough, you can transplant it into a container with soil. Soon you’ll have more Polka Dot Plants than you know what to do with!